On June 26, the government commemorated the International Day Against Drug Abuse by burning illicit drugs with a street value of more than US$200 million at a lavish ceremony in Yangon. Despite these publicity stunts, drugs remain a major issue in Myanmar, with the country still the second-largest producer of opium in the world. 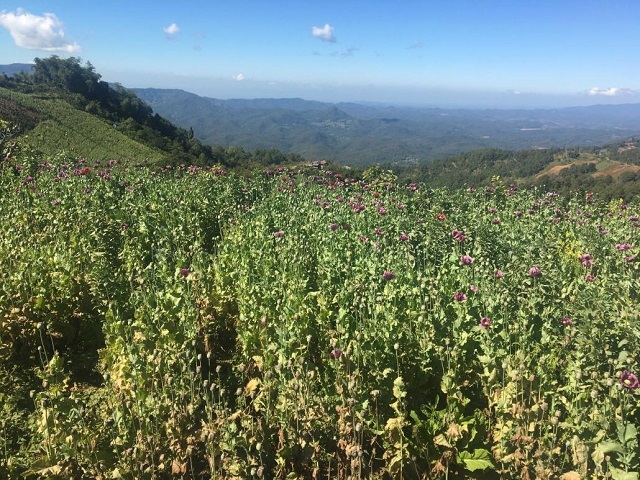 Frontier’s Oliver Slow spoke to UNODC regional representative Mr Jeremy Douglas about the extent of illicit drug use in Myanmar, measures being taken to improve treatment for users and the agency’s programmes aimed at combatting transnational crime. To what extent is Myanmar a hub for the drug trade in Southeast Asia? This really is the epicentre of the drug trade, at least in the Mekong region. If you look at the heroin trade, it is the epicentre; if you look at methamphetamine, it is one of the key players. If you start at the production side of drugs, we’re looking at precursor control. Precursors are the chemicals you need to make drugs, and they are coming from China and India primarily. This country does not have the chemical industry needed to make both major drug types, heroin and methamphetamine, which require chemical flows in order to be made. The drugs are being made in high volume, which means there’s a high volume of chemicals coming in. We are really putting a push on regional cooperation to stop or slow the chemical trade into the drug producing areas, because they would hopefully make a bit of a dent in production. We really have to emphasise that – it’s something that is under-appreciated and needs a lot more attention. We’re also looking at production itself in the country, looking at the source of the drugs. So if it’s heroin, it will be Shan State – northern Shan and southern Shan – and we’re working with the government in southern Shan State. And then if its methamphetamine then it’s around some of the ceasefire group areas. So we are talking to [the government] about how we can reduce trafficking flows, and we’re also talking about drug use and drug treatment. We’re really trying to prioritise how we can improve the delivery of drug treatment through the public health system. We’ve been working with the government and surrounding country governments who have agreed on a new modality for drug treatment that will, from our perspective, be much more effective. The tradition here has been something called compulsory drug treatment; basically someone is a drug user, they come into contact with the justice system and get put into treatment, but it’s not voluntary, and not necessarily based on scientific evidence. Working with the World Health Organization, we’ve come up with a programme called community-based treatment, which helps stream people into appropriate treatment. It is voluntary and evidence based. The government here has signed on to this with its neighbours and now we’re looking at how we can scale up with the Ministry of Health. Do you have a timeframe for implementation? It’s already started. We have started training and we have got more training sessions for medical practitioners in the next couple of months. The reality is that it’s going to take funding, and so the government itself has to look at how it’s going to be able to deliver it. We’re going to be able to assist with some funding, but it’s going to be somewhat limited given the size of the drug problem. So we really need the government itself to make an investment. Why is this approach an improvement? At a fundamental level you need things to be voluntary. People who volunteer for medical treatment go because they want results. Which means when they go in, they are doing so on their own volition and want to come out the other side not using drugs. But when people are forced into drug treatment, or they end up in prison, often there is no rehabilitative effect. It doesn’t actually reduce drug use or harm type activities. So this will improve the outcome of the treatment. We are training people in how to identify certain signs of drug use, and the type of drug use that a person has, and we stream them appropriately. For example, only about 10 percent of drug users need residential treatment, the other 90 percent need varying forms of counselling and lifestyle choice advice on how to reduce their drug use. You mentioned poppy cultivation earlier. What sort of trends are we seeing in this area? We’ve seen it level off, but it has levelled off at high amounts. So if you look back a decade ago it was at a low of say 20,000 hectares or so. We’re now looking at just under 60,000, but it has levelled off. What do you think is the reason for hitting that plateau? There are a variety of reasons that it would have levelled off. Some of the interventions we’ve had with the government have been somewhat successful. They’ve been modest in scale, but have been successful in reducing [cultivation] in certain areas. At the same time there are market indicators at play. Demand for opium is probably at equilibrium point, so that will be another reason. UNODC issued a report earlier this year saying that poppy cultivation is higher in areas with poor security. Could you talk a bit about that? We see this around the world: where the government is able to provide security and good governance, you generally don’t see drug cultivation. That happens in South America, in Colombia for example, and it happens here in the Golden Triangle. If you look at the pattern of conflict here, particularly places like northern Shan where there has been an outbreak of conflict with different groups, that actually is the one place in the country where you do see rising opium production. That’s not surprising. There’s … no government control regarding the social issues and education. These places are cut off, they’re isolated, and drug production is one of the ways they can make a living. How much of an issue are methamphetamines in Myanmar today? Yes, I think it’s safe to say that. The police have been telling us for a couple of years, but it’s really now proving itself to be true. It’s highly available in almost every corner of the country. You didn’t see that five or six years ago. Then, it was mainly for export, but now it’s actually being used inside the country. At the same time, we’re seeing diversification of the market. It used to be yaba, which is a low-grade pill form of methamphetamine, but now we see crystal meth, which is high purity. We’re seeing large seizures of crystal meth that have emanated from certain parts of the country. Have you identified a reason why there’s been such a proliferation of these types of drugs? There’s been an attempt to understand the demand. It started to take place a few years back, and so the demand is still there. It was dumped into the market at a very low price. In some parts of the country you can buy it for a dollar a pill. It’s cheap in other markets, but not that cheap. So it’s cheap and easily available here. Last week a video was posted on social media of yaba pills being hidden in chillies. How sophisticated are these networks becoming and how difficult are they to track? This comes back to the difference between methamphetamine and heroin. Because methamphetamine isn’t geographically specific, it can be made basically anywhere, so the fact of the matter is we don’t know exactly where it comes from. You can’t trace it back to source, which means you have to develop intelligence on the networks, and the networks that make methamphetamine are very different from those that make heroin because they’re very small and tight-knit. And they can use different techniques. As you say, they can embed it in things like chillies, they can embed it in any product essentially, so it’s really hard to trace and track. UNODC doesn’t only focus on drugs. What are some of the other crime-related issues that you’re following closely in Myanmar? One of the bigger issues that we’re concerned about here right now is timber trafficking. The country is a source country, one of the few in the region with remaining large original forest cover, and there’s [a] market nearby where there is a lot of demand for high value timber. We’re also looking at other forms of transnational crime: human trafficking, migrant smuggling. We’re very proud of our border management programme. We’ve established borders posts with neighbouring countries, one on either side of the border, to help countries cooperate together. Those border posts can work on multiple types of transnational crime. We’ve established them with China, Laos and Thailand and now we have a team leaving to go to Maungdaw [in northern Rakhine State] and establish one on the Bangladesh border. Another issue attracting a lot of attention in Myanmar is wildlife trafficking. Are you also involved in combating that? Often there’s a connection between wildlife trafficking and timber trafficking, so we have a programme working with the government on both. This country is a source country for wildlife, which might be going to larger markets in neighbouring countries, but it’s also potentially a transit country, like Thailand. This place has an active international port, and therefore has the potential to be a transit country. And are there any animals more at threat than others, or is it all of Myanmar’s wildlife? I think it’s all of it. We’ve seen a large number of reports recently, and our wildlife experts talk about the trade in elephant skins, which is apparently harvested from elephants here for medicinal purposes. People believe [the skins have] special healing powers. That’s very alarming if it’s happening on a large scale because there aren’t many elephants left. Of course we also know about pangolin and different bird species that are being trafficked.